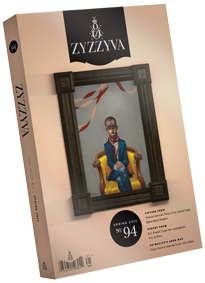 This Saturday, April 7, at 4 we’re launching the spring issue of Zyzzyva magazine at Catherine Clark Gallery at 150 Minna St. in conjunction with the gallery’s 21st anniversary celebrations. Zyzzyva managing editor and illustrious book reviewer Oscar Villalon, Jonathan Keats, and Katherine Silvers will read. There will be booze, I assume, since it’s a literary event hosted by an art space and that usually indicates some measure of civilized debauchery. The spring issue features artwork exclusively from CCG, as well as excellent and harrowing essays on the Mexican drug war, short stories from Robert Ehle, Wanda Coleman, Lyndsey Thordarson, and others, and the usual stellar poetry. I copyedited this issue, which was difficult, as the material was so fascinating it was hard to pay attention to whether the punctuation was correct, especially since I only sort of know what to do with apostrophes sometimes. The Ehle story was one of my favorites–I forgot while I was reading that it was written by a man, he got into the head and heart of his female protagonist so completely. This also made me wonder what it is about writing that suggests the gender of the author, something I first thought about towards the end of Written on the Body, having forgotten the name of the author and was shocked to realize it was a woman (the awesome Jeanette Winterson). Don Water’s story about a woman a little too passionate about animal rights had my clutching my stomach, and the Mexican drug war essays reinforced my awe at the courage of journalists as well as, basically, anyone living in the border towns. Photogeeks will appreciate Lyndsey Thordarson’s story about a girl living on her own in the woods in the nineteenth century. This entry was posted in damn good, EVENTS, publishing, San Francisco and tagged ART, Catherine Clarke Gallery, galleries, literature, San Francisco, writers, Zyzzyva magazine. Bookmark the permalink. 1 Response to I’m going to the Zyzzyva Spring issue launch at Catherine Clark Gallery. Are you? After reading your post, I’d love to go. Unfortunately, I live in Seattle and can’t afford to zip down to San Francisco for an overnight. However, what not let me worry about the apostrophes next issue? I have 30 years’ experience in copyediting and would need to be paid, but for this, I’d keep the rate gentle.